What does the precarious contraption on the right have to do with Google Glass? I generally try to resist the temptation to get caught up in the hype over new consumer technology. It’s part of my desperate effort to convince myself that my purchasing decisions are rational and considered (Really! They are!). That being said, I’m willing to make an exception in the case of Google Glass. A completely hands-free wearable computer that sees what you are seeing and is controlled with highly sophisticated voice-recognition technology? Shut up and take my money. Or rather, shut up and take my money five years from now, when the third generation is being released and a considerably less-exciting knockoff brand has come within my price range. Still, I’m happy just to live in a world where there are futuristic cyborg internet-glasses, even if I can’t have them myself. My excitement and financial limitations aside, however, I think that the Google Glass concept, when considered alongside a range of other smartphone-related innovations that have surfaced in the last year or so, suggests that we are on the verge of fundamentally changing the way that we interact with computers. That will be fascinating, in a being-present-for-history-in-the-making kind of way. But it also signals that the immediate future of communication technology is probably going to involve a lot of conflict. I’ll elaborate a little bit more on that in a moment. But first I want to talk about bicycles. Really old bicycles, specifically. There’s a good chance that you have seen pictures of the penny-farthing bicycle that was popular in cities around the nineteenth century. They look ridiculous from a present-day perspective, and they had considerable technical problems. The penny-farthing, you see, was designed for speed, with a big front wheel to allow the maximum possible gear ratio. This configuration had obvious drawbacks. It was hard to get on, difficult to pedal, and carried the constant risk of “doing a header”, in which the front wheel would stop abruptly, causing the rider to flip headfirst over the handlebars and fall straight onto the ground. Risks to life and limb aside, penny-farthings were also fundamentally unsuitable for nineteenth-century women, whose long, socially-mandated skirts would ride up on the frame. Essentially, the penny-farthing was only suitable as a means for upper-class men to enjoy the thrill of speed, so long as they didn’t mind getting their face smashed in on the cobblestones from time to time. Its usefulness for safety-conscious commuters was limited at best. The diverse problems experienced by diverse social groups led to a diverse range of solutions. Removable handlebars were added so that riders could leap off the bicycle and land on their feet if the front wheel stopped too abruptly. 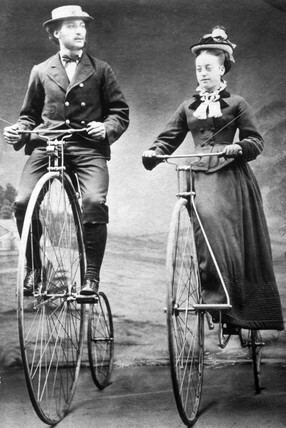 A particularly hilarious solution to the skirt issue was to make a side-saddle version of the penny-farthing. One can only imagine how difficult it would be to balance on such a machine. These and other ad-hoc modifications maintained the general form of the penny-farthing, because the privilege enjoyed by upper-class recreational riders allowed them to set the general form of the bicycle. Only once a chain drive was invented, allowing high gear-ratios without gigantic wheels, were the concerns of women, the elderly, or lower-classes (who presumably just wanted a cheap and safe bicycle to ride to work) seriously accommodated. The now ubiquitous safety-bicycle, then, could only be a viable solution for the safety and gender problems of cycling once a technical compromise was reached that allowed the dominant and privileged user group to retain their desire for speed. The lesson here is that privileged groups often get to define the fundamental purposes of new technologies, and in so doing define the problems that will be addressed by designers, contributing to a form of technological marginalization and conflict. So what does this have to do with Google Glass? Well, when we consider the above parable (which is foundational to a theory called the Social Construction of Technology, in case you’re curious), in relation to smartphone innovations we can observe a few things. First, smartphones have many classes of users with many different needs: business users who need to be able to type and send long e-mails effectively are contrasted with social users who are more concerned with style and technical flexibility. The problems of smartphones are also diverse and socially constructed: some people see the distracting nature of smartphones as a liability to a fulfilling social life, while others see smartphone use as a legitimate form of social interaction in and of itself. Some people want to use their phone for reading and watching movies (necessitating a big screen), while others want it to fit easily in the pockets of their skinny hipster jeans. This has led in recent years to an amazing diversity of proposed solutions to the problems presented by the dominant smartphone design. Google Glass deals with the interface and distraction issues by having the user interact with the phone through voice and sight, rather than pushing buttons. Some, however, might protest the effects of this on privacy and the ability to meaningfully disconnect. A new Samsung phone, which allows users to control their phone with only their eyes, solves some of the same problems of Glass in a less radical way, but still requires users to look down to use it. Meanwhile, ultra-thin flexible screens promise a potential big-screen future smartphone that can be rolled up to fit in a pocket, and dynamic button technology allows all the ergonomics of a blackberry-style keypad with all the flexibility of an iphone-style touch screen. The interesting thing about all this is that not all of these innovations can co-exist. A flexible screen would be meaningless on Google Glass, for example. Furthermore, each of these innovations is aimed at solving a different problem, while potentially leading to different problems of its own. It is likely that there will eventually be a dominant new configuration for the personal communion device-market technologies tend to converge around particular solutions-but different kinds of users have a stake in the implementation of different kinds of innovations. If I am correct and this new configuration is shaped in the next few years, then what we have on our hands is a recipe for social conflict. This conflict will be interesting to watch; I think it will qualify as a major moment in technological history. But we should make sure we take a critical approach to it. Just as the dominant penny-farthing bicycle was the product of the demands of a powerful group, so the dominant smartphone design could be the result of some kind of social, political, or economic privilege. It is possible for technology qua technology to be socially oppressive, and so we should be careful to consider this as these new phone designs begin to engage in serious competition with one-another. When new and revolutionary phones are released during the next few years, you should ask yourself who benefits, and who is disadvantaged or excluded by each one. And act accordingly. Bijker, Wiebe E., Thomas P. Hughes, and Trevor J. Pinch, eds. The Social Construction of Technological Systems: New Directions in the Sociology and History of Technology. Cambridge, MA: MIT Press, 1987. “I am studying how people talk at each other about ways to go places, like cars and trains. It will help us understand how people have word fights about the things that they use to do stuff. Sometimes when a person makes a new thing that helps people do stuff, it doesn’t get used because there is already a different thing that people use to do that same stuff. This can happen even if the new thing is better than the old thing, because people don’t like to change the things that they use to do stuff. Sometimes, however, really big stuff happens and the old thing doesn’t work anymore. That means that people might start using the new thing, but there will still be word fights between the people who like the new thing and the people who like the old thing. These word fights help to decide which thing gets used in the end. During the last hundred years, there have been a lot of word fights about what kinds of things we should use to go places. At first people liked to use trains, but then people started making cars. Then there was a big fight where lots of people from lots of different places hid in the ground and shot at each other. Then it happened again. Cars and other things like cars were good for these fights, so people made lots of places to make more cars. When the fights was over, these places made lots of cars for people, and people started using cars to go places and stopped using trains. There was a word fight between people who liked cars and people who liked trains, and the people who liked cars did better, and then lots of people started using cars, and less people started using trains. A few years ago, people started using a bit less cars, and a bit more trains, and there is another word fight between the people who like cars and the people who like trains. Some people say that too many cars will make the air very hot, but other people say they like their cars too much to stop using them. It’s been posted on this blog, where you can find a lot more summaries like it. If you’re working on a PhD or any other big research project, I recommend giving it a try. It’s an illuminating distraction from the daily drudgery of research work. These people can criticize our energy structures, but how can they be mobilized to create new ones? A few years ago, a group of students at my alma mater performed an experiment called “Dark and Dirty. The challenge was to live a completely impact-free lifestyle for one week. This is an interesting exercise in revealing just how locked in we are to unsustainable practices and lifestyles, but as a practical model the project project attracted some fairly well-justified criticism. One participant told me that while he enjoyed it, he thought it reflected a problematic assumption that sustainability should, in practical terms, be the responsible of individual consumers. Consumers, he reasoned, are constrained by social structures which would be more effective as a locus of technological change. The academic work on sustainability transitions appears to corroborate his concerns. Strategic Niche Management, a field that considers how change to a more sustainable system can be encouraged, emphasizes the role of the state in encouraging transitions processes. Most academic work on the matter suggests that transitions can be encouraged by acting on two levels: Things like taxation policy, and education campaigns can be leveraged to break up the entrenchment of established socio-technical regimes, while the development and improvement of radical innovations can be encouraged by subsidies, scholarships, tax breaks, and other policies designed to give them a short-term advantage. If all goes well, the increased tension at the regime level will open up a space which can be filled by one of the developing new technologies. While this might be good advice, its focus on state action has always made me a little bit uncomfortable. Where, I wonder, is there room for truly democratic control over technology and sustainability in this framework? Of course the state actors implementing the policies of strategic niche management might be elected, but they may also be appointed bureaucrats. In fact, the literature on strategic niche management states in a few places that popular pressure could be a major impediment to these kinds of transitions. It seems that the criticism of Dark and Dirty has some merit, but only in a somewhat depressing way: popular involvement in transition processes, if we’re lucky, might be limited only to occasional election campaigns, whose substantive influence on technological change will likely be small. So what’s an eco-conscious consumer to do? What if we don’t like the direction that our leaders are taking our technological systems? Is there any way to enact socio-technical change from below? I’ve been very interested in this question for the last few months, and I have a few preliminary thoughts on the matter. Using the model of strategic niche management, we can infer that we should find ways to put pressure on the existing regime (action from above), while also finding ways to support promising niche-innovations (action from below). The trick is to find ways for popular pressure to accomplish these two ends without relying on the state. Enacting pressure from above to break up technological regimes is the more straightforward of the two options, so I’ll address it first. Socio-techincal regimes are composed of complex, interlinking webs of political, cultural, financial, infrastructural, financial, scientific and technical arrangements. People use cars because of urban sprawl because businesses tend to take up a lot of space because businesses need parking lots because people use cars. That kind of thing. This entrenchment can be broken, however, by weakening some of its constituent elements. Grassroots activism can affect change in these structures, most obviously in the case of political structures: Activists can use protests, letter writing campaigns, sit-ins, and other methods to set political agendas and challenge the interests supporting existing unsustainable regimes. Since infrastructure is most often built by the state (or at least by companies that are sensitive to public relations concerns), a similar method can be used to encourage infrastructural change. Cultural activism, which also includes marches and sit-ins but also cultural activities such as artistic works that challenge entrenched cultural norms, can play a role in eroding the cultural attachment to unsustainable technology. Similarly, financial support for the existing regime can be challenged through actions such as boycotts. If a large, popular movement strategically combined these measures, it could weaken the social entrenchment of an unsustainable technology, making it easier for competing sustainable technology to succeed. These kinds of attacks on the status quo, however, are insufficient to affect change all by themselves. Tension in the dominant regime will only contribute to a transition if a viable alternative technology exists. This is the second aspect of the transition process, and it requires a little bit more thought. The goal is to have popular, grassroots actions that can encourage the development of new and sustainable technologies. New technologies benefit from having strong, protected niches that allow them to grow and develop until reach commercial viability. Therefore, the process that I am tentatively calling Popular Niche Management cannot be limited to mere consumption of sustainable technologies. It is not enough merely to spend a bit of extra money to take the hybrid bus. One must also try to help the hybrid bus to become cheaper so that less environmentally conscious travelers will be more inclined to use it. I have come up with a series of ways for individual citizens and consumers to do this, which I have organized into three levels, each one reflecting a greater level of commitment than the last. Level 1 is financial support. Niche innovations need money to pay their developers, to cover running costs, and to promote themselves. The simplest way to do this is through mere consumption (taking the hybrid bus), but as I have stated this is insufficient. New innovations need to raise capital if they are going to develop to the point where they can contribute to the established regime. Unfortunately, the future of sustainable innovations is often uncertain, meaning that traditional sources of capital may be reluctant to invest in them. One way around this is through crowd-funding Most sustainable technology start-ups have funding campaigns on kickstarter or similar websites, and others (such as Brew Dog, who develop important technological innovations in the field of awesome Scottish beer) have developed offline ways of doing the same thing. If you think a new technology is promising and deserves a chance to become more commonplace, then you should not only purchase and use it; you should also find a way of providing money to fund its further development. Level 2 is feedback and promotional support. The developers of new technology need to know how exactly to make that technology better, and often there are aspects of this that cannot be seen inside the development lab. That’s why many companies are really eager to get you to fill out customer experience surveys. Giving further support to a new sustainable technology start-up therefore, can be as easy as filling out their online comment form, or sending them an email with detailed feedback if they do not have one. This will help them better tailor their product to the market, which will make it more competitive. Somewhat related to this is promotional support. The creators of radical innovations tend to develop visions of a positive future which feature their invention in order to gain more support. This can be a powerful tool in getting more people interested, and as a consumer you can help. If you just bought a neat new solar-powered phone charger, then tell people! Use real-life conversations and the internet to tell people the potential you see in solar-powered phone charging, and how great it would be if it becomes more widespread. The goal is to get more people to become early adopters just as you have, effectively making new sustainable technology “go viral”. Level 3 is the most ambitious: active involvement in the development process. That’s right: you have to take a hands-on role in developing and perfecting new technologies. You don’t have to be an engineer to do this, either (although you can be more effective at it if you learn some technical skills). Many new sustainable technologies (window farming and sustainable housing, to name two examples), have been able to crowd-source their development by creating a vibrant community of people who experiment with new and more efficient ways to do things. If you think 3D printing is the way of the future, for example, then build a reprap and get involved in it! This is almost certainly the most time and resource-consuming of the three levels, but it can also be the most fun. This post has been mainly geared towards sustainability, but it also applies to technological democracy more generally. Similar ideas can be used to help encourage the proliferation of social networks that are less sketchy than facebook, or to find new ways of distributing entertainment that subvert the entertainment industry. I think a similar strategy can be effective for any of these. Whatever the goal, this strategy will be more effective if it is coordinated. This suggests a useful link between the top-down and bottom-up forms of activism: Climate justice rallies can be used as a way of building networks to support new sustainable technologies, for example. Of course, these are mostly just brainstorms from a guy who has read a bit on the topic. We need to have a larger discussion about how we can take real democratic control not just of our political systems, but our technological systems as well. If we find effective ways of doing this, then it will not just be a boon for sustainability, but for democracy as well. Kemp, R., Schot, J., and Hoogma, R., 1998. “Regime shifts to sustainability through the process of niche formation: the approach of strategic niche management”. Technology Analysis and Strategic Management 10:2. pp. 175-795. Kemp, R., Rip, A., and Schot, J., 2001. “Constructing transition paths through the management of niches”. In Path Dependence and Creation. Lawrence Erlbaum, ed. London: Mahawa. pp. 269-299. Lovell, H., 2004. “Framing Sustainable Housing as a Solution to Climate Change”. Journal of Environmental Policy and Planning 6:1. pp. 35-65.